Shopping for Rick and Morty Pop! Vinyl Figures? Go ahead... give him a task to complete. Go on adventures across the universe with the adult animated science-fiction sitcom Rick and Morty. In what may be a science experiment gone wrong (or gone delightfully right! 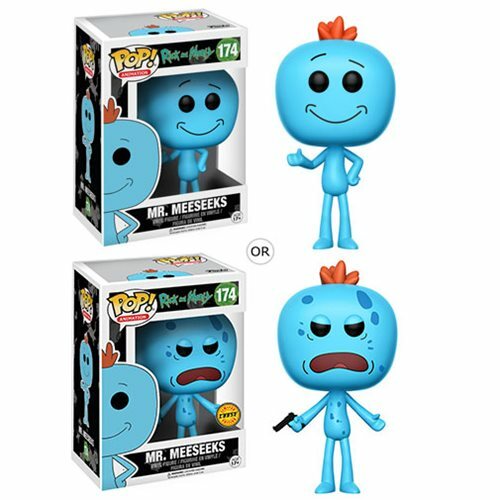 ), Rick has turned Mr. Meeseeks into a Pop! Vinyl figure! The Rick and Morty Mr. Meeseeks Pop! Vinyl Figure measures approximately 3 3/4-inches tall and comes packaged in a window display box. Ages 17 and up.